For most of my life, I have been fortunate enough to have been exposed to both live and recorded music. The Five Fingers Combo -- vibes, rhythm and bass guitars, drummer, and percussionist -- rehearsed next door to the home of my paternal grandmother, with whom I spent formative years. The same neighborhood housed the panyard of City Syncopaters Steel Orchestra, about 150 meters away from the abode of my maternal grandmother. Mother owned a very good-sounding Knight piano, on which she frequently played classical music with panache. I have no recollections of the gramophone era, but my father entered the high-fidelity game early, purchasing a Stentorian system (my research indicates that it may have been a model HF1214) that consisted of a monaural tube amplifier driving a 12" full-range loudspeaker. The source was a turntable with a Collaro ceramic pickup, attached to a Cobra tonearm. The components were all housed in a mahogany cabinet that included a compartment for storage of long-playing records. Samuel L. Sandiford was very fond of classical music. He was also a teacher who gave free private lessons to hundreds of children for over six decades. Knowing his love for the genre, parents would give him vinyl as presents on every possible occasion. Hence, there was never a shortage of new listening material at our home. In due course, his collection grew to over a thousand albums. By any standard, the Stentorian sounded horrible at best, but no one dared tell my father that. Needless to say, he was an idiosyncratic freak who would religiously drive the system into distortion. Standing on our veranda, Sam would often conduct Tchaikovsky or Beethoven, to the amusement of passersby. Somewhere along the line my dad was introduced to Henry Lee, an audio technician. Lee immediately proposed an upgrade to the system and installed a tweeter and crossover. The results of this tweak were startling, and I consciously realized that my mother subsequently felt more comfortable whenever the equipment was played. This experience has served me in good stead ever since. Most women tend to take a back seat in hi-fi matters. They usually complain that speakers do not match their décor, and seem to take little interest otherwise. I guess that theyre too busy with their own household affairs to find quality time to sit and relax with male companions. However, they are usually the first to recognize a change in the characteristic of a systems performance, whether for better or for worse, for richer or poorer. Once, I deliberately reversed the polarity of the connection to the terminals of one of my loudspeakers, putting it out of phase with the other. After a while, my eldest daughter screamed, "Daddy, your music is irritating me!" More recently, my wife casually commented very favorably on the sound of her favorite album, Carole Kings Tapestry, when I played the SACD edition through my NAD M5 player. She meekly asked whether it was the same disc she was accustomed to hearing. I was an only child who very quickly learned to play my parents against each other. Mother insisted on piano lessons. However, the chosen music teacher, Mrs. Isabella Hicks Thomas, was very strict, and would often rap students sharply across their knuckles with the edge of a ruler or blackboard duster. This did not augur well for me, as one of my favorite pastimes was pitching marbles for bokie. (According to Cote Ce, Cote La, the Trinidad and Tobago Dictionary, a bokie is a blow to the knuckles, as punishment to the losers in a game of marbles.) I told my father that music was interfering with my studies, and that was that. I also encouraged him to purchase a chemistry set, in order that I might become more acquainted with this remarkable science. My brief encounter with the subject came to a rude awakening when our home almost caught afire after I put a match to some gunpowder I had formulated in a crucible. By this time I had made friends with Henry Lee and would spend Saturday afternoons at his home, watching him repair electronic equipment. He started me building crystal sets and tinkering with tubes, transformers, resistors, capacitors, inductors, and the like. My love for electronics grew to such an extent that I decided that audio would eventually have to become my livelihood and my hobby. After gaining some experience, this sorcerers apprentice built a simple 10W tube amplifier and advised his father to purchase a Garrard turntable with moving-magnet stereo cartridge. With the guidance of Henry Lee, we acquired a pair of Goodmans Audiom 80 woofers, with matching midranges and tweeters, from a well-known hi-fi shop in Port of Spain, the capital of Trinidad and Tobago. Henry drew a schematic diagram for a three-way crossover, and we made cabinets to the manufacturers specifications. The entire project was configured within a few months. Over tea one afternoon, a few of us auditioned a copy of Tchaikovskys Piano Concerto No.1, with John Ogdon on piano and Sir John Barbirolli conducting the Philharmonia Orchestra. This was my introduction to the world of stereophonic sound. Eventually, the tube amplifiers were replaced by a solid-state preamplifier and power amplifier, handcrafted by Frank Chu Cheong and me. I had been bitten by the bug, and there would be no cure. My only regret -- that I never returned to playing music -- continues to bother me, even at this stage of my life. Audiophiles exist in every corner of this world. In smaller communities, such as Trinidad and Tobago, they tend to know each other very well. These geeks usually frequent listening sessions where no one really focuses on enjoying music. Small talk is always centered on whose system is better, who has the most recent upgrades, whose components are the most expensive. Nevertheless, at such sessions I was fortunate enough to meet three gentlemen who shaped my professional career. The late Lionel Seemungal was easily the most rounded scholar whom I have ever met. Simultaneously a mathematician, linguist, and engineer, he was a lawyer by profession, and closely associated with Emory Cook, an American entrepreneur who became famous for establishing Cook Records. Over time, Cook released a vast repertoire of on-location recordings that captured the intoxicating rhythms of the inhabitants of our Caribbean islands. Many of these titles are now available on CD and digital download through Smithsonian Folkways, and one of my favorites is Calypso Awakening: From the Emory Cook Collection (CD, Smithsonian Folkways SFW 40453). Cook and Lio Seemungal built a pair of infinite-baffle Bozak enclosures, each of which weighed over 1100 pounds. Each of the two main cabinets contained four B199 woofers, whose variable-density cones were made of a mixture of paper and lambs wool. Tweeters and midranges were housed in smaller enclosures, mounted atop their massive counterparts. Air-cored coils were meticulously hand-wound and hardwired to paper capacitors. The gentle slope of the resultant crossover units was 6dB/octave. Lios Bozak system was driven by Marantz tube electronics and could reproduce anything effortlessly. Seemungals famous question to visitors was, "So what would you like me to play for you today, noise or music?" He would then choose appropriately from a seemingly infinite repertoire of Chopin, earthquakes, Beethoven, volcanoes, Calypso, Steelband, airplanes, the Beatles, or whatever. His archives even contained a recording of a blast from the steam whistle of the famous Cunard luxury liner Queen Mary, recorded by Cook. Unfortunately, the cabinets that housed the woofers had to be destroyed a few years before his passing. Termites had eaten their fill of the 2"-thick, glued and screwed marine ply from which the system was constructed. Fortunately, the internal steel braces survived the ordeal. Neil Lau is a retired chemical engineer who continues to enjoy the life of an octogenarian. One of his companies, Industrial and Medical Electronics, represented Philips throughout the Caribbean. It was through Neil that Sanch was able, in 1982, to introduce to Trinidad the first generation of their compact disc players, the model CD 303. Everyone in the world remembers the (in)famous tagline: "pure, perfect sound forever." Lau owned everything, including a pair of Philips RH532 MFB motional-feedback loudspeakers, described by their designers as being giants in sound, dwarfs in size. He generously gave me a copy of the Philips Motional Feedback Demonstration Record (LP, Philips 6830 532) which contains an outstanding collection of jazz and classical pieces. Edward (Teddy) McDowell worked at the Trinidad Broadcasting Company (Radio Trinidad) for his entire life. He began as an apprentice technician in 1947, graduated to Chief Engineer, and retired as Managing Director in 1995. Being responsible for all aspects of technical operations, he had to have a reference system. In those days, it consisted of McIntosh C28 preamplifier and MC2205 power amplifier, Thorens turntable with SME tonearm and Decca cartridge, ReVox A77 and A700 open-reel recorders, and B&W loudspeakers. The youngest member of this most illustrious company had access to a wealth of live BBC recordings of famous Evenings at the Proms concerts. What I treasure most of all, however, is a version of Benjamin Brittens The Young Persons Guide to the Orchestra, brilliantly narrated by Sean Connery. A commercial version may not exist; I will always be grateful to Teddy for giving me a copy on cassette. I have since converted it to CD and use it to introduce students to classical music. It was only a matter of time before I invested in my own first set of high-end components. These consisted of Teddys McIntosh C28 preamplifier and Neils McIntosh MC2205 power amplifier. The sources were a ReVox B795 tangential-tracking turntable and B77 open-reel tape recorder, purchased from Willi Studers local representative. In time, I built a version of the Bozak enclosures designed by Seemungal and Cook. Sanch eventually became an authorized international distributor for the company. I later acquired more McIntosh components: a C33 preamplifier, an MC2500 power amplifier, and an MR80 tuner. These three instruments still form an integral part of the companys fixed asset base, and have been operating daily since 1982. In short, I entered the McIntosh fraternity the way most Mac owners do: by purchasing used equipment, and thus allowing their predecessors to upgrade. But I didnt become aware of this fact until I met the most famous member of the McIntosh sales force, James Carroll. I became a McIntosh representative in 1982, when I flew upstate from New York City to Binghamton to spend a hectic week with President Gordon Gow, Executive Vice President Maurice Painchaud, Director of Acoustic Research Roger Russell, and Vice President of Engineering Sydney Corderman. But even before this, I had the experience of a lifetime, witnessing firsthand a demonstration of how the companys astute salespeople recruited its disciples. One Saturday morning, the aforementioned James Carroll drove me across the George Washington Bridge, from Manhattan to New Jersey, where I witnessed my first McIntosh Amplifier Clinic. The shop, Leonard Radio and Hi Fi, was a hive of activity. Under the watchful eyes of engineer Dave OBrien -- who, in 30 years worth (1962-1991) of McIntosh Clinics held all over North America, tested and evaluated more than a million amplifiers -- two technicians set up a test bench with a wide assortment of components, service manuals, oscilloscopes, soldering irons, variacs, distortion analyzers, signal generators, the works. Dave O'Brien at a McIntosh Amplifier Clinic. In the courtyard, people were queuing up patiently, some carrying as many as four pieces of equipment. Carroll told me that the Amplifier Clinic was free, and that today it would be for McIntosh customers only. Their instruments would be restored to their original factory specifications and certified. On Sunday, anyone else could bring in their equipment for evaluation, repair, or both. On both days, customers would receive certificates of compliance that detailed key specifications of the various models after they had been tweaked. What interested me was the presence of a high-powered Wild Heebrug microscope on the bench. Carroll told me that this device was used to illustrate the degree of wear of phono-pickup styli. I later discovered that McIntosh had recently introduced the MCC1000 moving-coil cartridge, a prestigious product custom-manufactured for them in Japan by Okie Sugano. By demonstrating the longevity of their styli under this microscope, the companys salesmen would be able to easily convince potential customers that an investment in this cartridge was sound. Of course, potential customer Simeon Louis Sandiford was soon transformed into an actual customer, and is still the proud owner of MCC1000 no. 0576. Carroll would frequently cast a professional eye on an unsuspecting candidate waiting in line. "Sir, while you are waiting, let me invite you to one of the showrooms to exhibit some of the features of our new instruments. Did you know that we were recently granted a patent for Power Guard circuitry, which protects your investment in our power amplifiers? For your convenience, our flagship preamplifier, the C33, is also equipped with an onboard 10W stereo power amplifier that also incorporates this feature. Let me show you . . ." We would walk toward a showroom. "Do you realize that we have the largest anechoic chamber in the industry, used exclusively for designing McIntosh loudspeakers?" Naturally, the showroom would be brimming over with McIntosh C33 preamps, MC2255 power amplifiers, XRT20 tweeter columns, etc. Carroll would then get down to work. It was instantly obvious to me that this salesman relished his portfolio. They would audition music, mainly selected by the customer, for 20 to 30 minutes. During this period, Jim Carroll would ensure that his client acclimatized himself with the feel of the components. Carroll would then say, "Well sir, I am sure you realize that Mr. Corderman has been keeping our research department busy. The distortion in our new instruments is at least ten times less than that in your older model. And they are all backed by traditional ten-year warranties and service policies. Why dont you trade yours in today?" Now, what would you do? Or rather, what else could you do? On that day alone, James Carroll sold just over $100,000 worth of new product. Nor was he the only salesman on the premises. Nor was this the only shop in which McIntosh Amplifier Clinics were held in North America. No wonder Jim was able to accommodate me at the Waldorf-Astoria for the weekend. When I had checked in at the hotel, wondering why on earth McIntosh would book me there, the concierge had simply said, "Your bill has already been taken care of, sir." So began my learning curve. I never bothered to figure out what would have transpired had I insisted on staying at a less prestigious hotel, or even motel. The next day, Sunday, Carroll was effervescent, bubbling with enthusiasm. There were even more customers than on Saturday -- owners of traditional hi-fi gear made by Sony, Kenwood, Pioneer, Sansui, etc. Jim had one dismissive phrase to describe them and their equipment: "Bottom of the pyramid," he would say. "The first question a good salesman must ask himself of such a customer is, What is my money doing in his hip pocket? Once you have figured out the answer, then its time to get down to work. It is as simple as that." Following a procedure similar to Saturdays, the Clinic began promptly at 10 oclock. More meticulously than before, Carroll assessed his prey. "Let us get this one to cross the threshold, Simeon." Then he casually slipped into high gear. "Sir, I would like to give you a copy of our latest McIntosh Newsletter. It is mailed free throughout the world to our ever-growing family of customers. While you are waiting your turn, please let us give you a demonstration of the latest models in one of the showrooms. May I introduce you to Mr. Simeon Sandiford, the new McIntosh distributor for Trinidad?" The demonstration ritual was similar to Saturdays, but the hook line was different. I could not help but smile, having had no idea that I was the new McIntosh distributor for Trinidad. "Sir, I am sure that you realize by now that you are in a new league. McIntosh is the Rolls-Royce of audio engineering. We can make it easy for you to join our family. Why dont you trade in your equipment at the end of the Amplifier Clinic?" Then he would pause. "We can offer you a pre-owned McIntosh system. It was tweaked and certified yesterday by our engineers before being bartered against an upgrade by a member of our illustrious family. Your turn will come." Or, depending on his assessment of the potential customer, Carroll might say, "May we offer you a cup of coffee? We can then discuss, at our leisure, your acquisition of one of McIntoshs new systems, after we have determined the resale value of yours at the end of this Clinic." Now, what would you say? Or rather, what could you say? That day, James Carroll and his cohorts casually grossed another $60,000 worth of business. On our way back to the Waldorf, I inquired meekly about the fate of the bottom-of-the-pyramid equipment that had been traded for McIntosh instruments. "Well probably throw them away," he said, nonchalantly. Over the course of those 72 hours, Jim Carroll and I became instant friends. I left for Binghamton early the next morning, Monday, having milked him dry of all his sales techniques. He gave me a training tape on Beta cassette. On my return to Trinidad, Nicky Inniss, managing director of Fernandes Distillers (1973) Ltd., makers of fine rums, was very impressed with Carrolls philosophies, and organized a special seminar at which the video was successfully presented to his entire marketing team. Flag bearer Jim Carroll long ago became just another statistic in the fiercely competitive world of high-end audio. But for me, he was the meekest, most freakish audio geek I have ever known. The McIntosh Laboratory Inc. building in 1966. 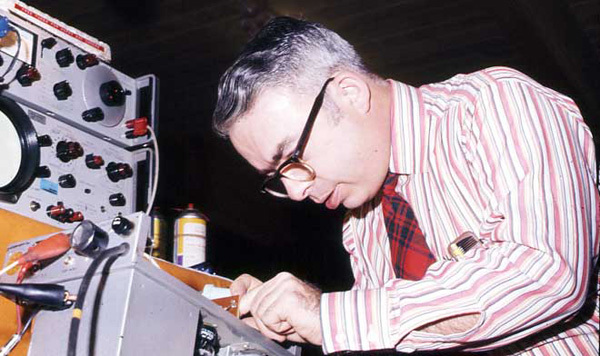 Frank McIntosh founded McIntosh Audio Laboratories in 1949. It was bought by Japanese giant Clarion in 1990 for $28.6 million USD. President Yutaka Oyamada promised that his company was "excited to build upon the McIntosh tradition of excellence." However, they retrenched all commissioned agents, preferring to deal directly with authorized distributors. In May 2003, Clarion sold McIntosh to another Japanese conglomerate, D&M Holdings. Today, McIntosh is as buoyant as ever.